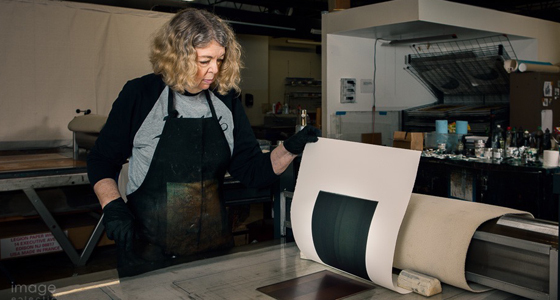 The Department of Art presents a visiting artist lecture with Katherine Brimberry, master printer at Flatbed Press in Austin. A fine art printmaker, Brimberry uses a collaborative, non-toxic approach to a variety of printmaking methods which includes intaglio, relief and monotyping. Admission is free and open to the public. Brimberry is co-founder and co-owner of Flatbed Press, a fine-art publishing studio of etchings, lithographs, relief prints and monotypes. As master printer at the studio, she is in charge of collaboration and production of artist projects. Her expertise is in the collaboration phase of projects, where she works as technical collaborator with artists such as Terry Allen, Michael Ray Charles, Trenton Doyle Hancock, Melissa Miller, James Surls and Julie Speed, among others. In the winter of 2010-11, the Austin Museum of Art produced the exhibit "Advancing Tradition: Twenty Years of Printmaking at Flatbed Press." In her own work, Brimberry uses the intaglio printmaking techniques to explore private and universal metaphors. Flatbed Press, founded in 1989 by Brimberry and Mark L. Smith, is located in Flatbed World Headquarters, an 18,000 sq. ft. warehouse redeveloped in 1999 as a community of creative professionals. Visitors have compared the aesthetics of the space to New York City's Chelsea-district warehouse galleries.